It’s somewhat ironic that Magic Magic went straight to DVD. The previous Sebastián Silva & Michael Cera collaboration, the low-budget road movie Crystal Fairy, was filmed as a means to pass the time while waiting for funding for Magic Magic, yet it managed to receive a limited theatrical release. It’s a bit of a shame that both didn’t get proper releases, as they are both quite interesting little films, albeit incredibly different. 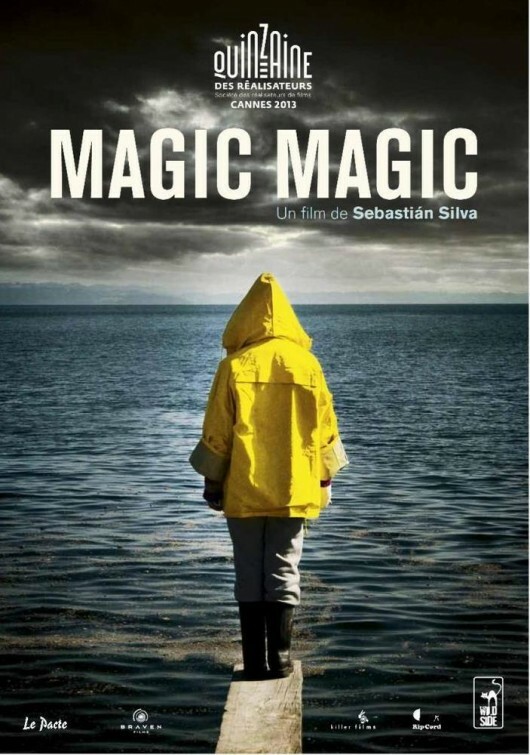 Magic Magic tells the story of a young American woman, Alicia (Juno Temple), who travels to Chile to visit her cousin Sarah (Emily Browning). Sarah has planned a long road trip to a secluded cabin, and she brings along a few of her friends: her boyfriend, Agustín (Agustín Silva), a local friend, Barbara (Catalina Sandino Moreno), and a fellow American, Brink (Michael Cera). The trip seems doomed from the start. Alicia has never left the U.S. before, and she is struggling to adapt to the new country. It doesn’t help that Sarah abandons her for part of the vacation to make an emergency trip back to Santiago, forcing Alicia to travel alone with people she does not know. Barbara appears standoffish, and Brink is downright creepy with some of his mannerisms. Alicia struggles to get any decent sleep, and her insomnia starts producing frequent hallucinations. We are left to question what is real and what is a dream for much of the film’s running time. This culminates in a final act that is so wildly different from the rest that it will make or break the film for most viewers. I loved the direction the film went, as it changed its tone at just the right time, right before Alicia’s behavior grew too grating. Juno Temple has been one to watch in recent years, and she delivers what may be her finest performance yet in this lead role. Her blank stares and disillusioned expressions perfectly convey the vast emptiness that appears to be her mind. It’s not entirely clear what mental illness she may have — or if in fact it is just a bad case of insomnia — but it’s hard to look away from her. And, of course, it’s great to see Michael Cera once again take on a different type of role here, this time being both ghoulish and unpredictable. Magic Magic may be a bit too much of a slow burn, but it’s a strangely enigmatic film that warrants a viewing. The odd Silva/Cera partnership continues to yield fruitful results, and I’m hoping this isn’t the last we see from them. It’s definitely worth a look. Hope you enjoy it. I’m a big fan of Browning and Temple, so I’ll be checking this one out shortly. Glad you enjoyed it. I was thoroughly impressed and I’m really glad Silva seems to be getting an audience. Silva definitely seems like one to keep an eye on. I enjoyed both of his latest films, and I’m curious to see what he does next. I really want to see this one, I love Juno and Emily, so I’ll definitely see it soon! This is arguably Juno Temple’s best performance yet. Hope you’re able to check it out soon. Sorry to hear you feel that way. The jarring final act is bound to upset some people, but I loved it. Great review! I actually dug the ending. It was very practical and realistic. If it had been something supernatural, it wouldn’t have fit with the tone. I love Temple and Browning, and it’s a shame this went straight to DVD. It deserved a theatrical run. Thank you! Glad to hear you were a fan of the ending as well — it certainly seems to be a love it or hate it type deal. And I completely agree about this deserving a theatrical run. Hopefully it finds a proper market via DVD/VOD.